The latest views doing the rounds in enlightened HR circles is that we should scrap the annual performance appraisal. It’s not for me to say whether we should or shouldn’t, but I’m always very wary of sweeping statements like this, and how the headlines can be misleading. At the CIPD conference yesterday I was debating the issue with people more ‘HR’ than me, and we quickly agreed that performance management in any organisation has a lifecycle: Some organisations perhaps don't need a formal appraisal process...but some do. Small organisations tend not to have anything formal in place at all. That’s fine. Then as the business grows, it’s decided that for consistency, performance reviews should take place. Great! So, a simple process and structure is put in place. Some people embrace it, and some people ignore it. At this point, someone high up tends to decide that the procedure needs to be more robust and enforced. So the process become more complex and completing a performance review/appraisal becomes mandatory. This is when performance review is at its most painful and adds the least value as people progress through what is essentially a paper exercise. However, we agreed that this stage is pretty much necessary. People have to get into the habit of having these meetings. In our experience it takes 3-5 years of ‘forcing’ people to have conversations (even stilted ones) before they accept that performance review is a normal part of management. When you get to THIS stage, you can start to dispense with the rigidity and formality. Now you can start to concentrate on giving managers the skills to have high quality coaching conversations, and the managers will be more receptive: if they have to have these discussions anyway, they might as well get value from them. When the quality (and complexity) is in the conversation, the process can be simplified until eventually, there’s no ‘formal’ process in place at all, just a culture of having meaningful feedback and coaching conversations as part of everyday work. That middle stage is difficult, frustrating and of limited value, but it is necessary in most organisations. It can be made a little easier if managers are trained in theskills of performance review rather than the process. Focussing on skills will also help to shorten the time it takes to get managers ready for the next stage. And you’ll be pleased to know that we can help with this via our performance management training bundle: Bite-size sessions that you can download and run yourself covering all of the basic skills required. In September and October I've had the pleasure of running Train the Trainer workshops again. The bonus with these is that a third day was added (a few weeks after the the initial 2 days) so delegates could design and deliver their own short training session. I learned loads...incuding how using bowls of crisps can bring statistical principles to life! I'm pleased to report that everyone found the sessions worthwhile and got something out of them. The most glaring learning point (even for me as an experienced trainer) was how much learning takes place when people actively get involved in exercises. Could I explain it to someone else so that they would understand? Can I use this understanding in a real life situation? Would I remember it in a month's time? The answer to all of these questions is "no"... yet I 'understand' it at the time. Of course, this also relates to having behavioural objectives attached to training. The company I was working with has a lot of professional services within in. They use 'understand' as a learning objective a lot. They are often pushed for time in training sessions and have a lot of content to get through. As a result, their 'training' sessions are typically briefing sessions with the opportunity to ask questions. It was pleasing to see them realise that this isn't enough. It doesn't mean people have learned, so a different, more active approach is needed to really switch on those lightbulbs and achieve REAL understanding. Activities aren't fluffly, childish or a 'nice to have' - they are fundamental to the learning process. That's why every single Power Hour Training session includes at least 2 of them to help bring the learning to life. Last weekend, we went to the Circus. It was a great afternoon's entertainment and no animals were harmed in the making of the show (it was an animal-free zone!)... but a couple of the people almost were! The skill of the performers is amazing. They make everything look so easy. The whip-cracking guy did quite a few tricks including tying a knot in his whip with a simple flick of his wrist. It looked so easy (and just a little unimpressive) that no-one clapped. So he did it again, and again and again. Clearly it isn't easy at all, but we didn't realise that. The high wire act was very impressive - two of the guys actually did a backwards roll on the wire...in perfect synchronisation! But although we were impressed, I'm not sure we truly understood how difficult this act was. When one of the performers fell whilst skipping on the wire, it became very evident how close to edge these performers are every single time they perform their act. Don't worry - he caught the wire, hoisted himself back up and did the trick again to a thunderous round of applause. It made me realise that being brilliant (or even good) at things isn't always fully appreciated. As managers, it's easy to take good performers for granted. (In the same was as schools seem to heap praise on more difficult/less able students and just leave those who consistently perform and behave well to their own devices). It's only when those top performers don't perform that we truly appreciate what they do day in, day out. After the high-wire man fell, I bet there was a heated debrief after the show to discuss went wrong. I wonder if they have similar debriefs on the majority of days when everything goes well? It takes effort, commitment and continuous development to do things well all the time. Because some people (whether in a circus or a more usual work environment) make it look easy, it often goes un-noticed. A once a year 'pat on the back' at the annual appraisal isn't enough. Good performers need to be appreciated, encouraged and thanked on a regular basis. Giving (positive) feedback , having regular one-to-ones, and celebrating success is just as important in performance management as the annual appraisal, giving negative/constructive feedback and creating performance development/improvement plans. A 'little and often' approach to performance management is far more effective than more traditional approaches. If your managers need help we have a wide range of bite-size training sessions on performance management that may just help get you started. I noticed a tweet last week that suggested that people don't buy training... they buy aspiration. Because I was delivering that day, I didn't get chance to investigate further. However, I understand that training may sometimes be a 'reluctant' purchase...like a maintenance contract on your PC: We want what it will do for us, not what it actually is. We train people so that bad things don't happen or to improve the current situation. In the same way, people don't like buying training materials (even when they are great value). Maybe they see it as a failure on their part. Maybe the feel they ought to be doing it themselves. Maybe the topic is genuinely very specific to them and off the shelf materials are just too generic. maybe they can't justify the expenditure. Maybe they are worried about losing control. I get it. I really do. However, designing great training (and associated detailed training materials) is time consuming. If you earn £30k per year, your salary alone is around £15 per hour (and then there are all the other benefits to consider), so a conservative estimate is £20 per hour. You spend 3 days (24 hours) designing a piece of training (which is again, conservative). The direct cost is £480. But what about indirect costs? What about all the other things that aren't getting done whilst you are engaged in design? Sometimes it makes more sense to buy in training materials and spend far fewer hours tailoring it to your organisation... especially when you can buy licence free editable materials from just £50. Doesn't it? It's a tough one isn't it? Of course, there are certain aspects of everyones job where training IS (and should be) compulsory. Anything that covers working safely or is critical to core processes is quite rightly considered non negotiable. But what about other skills, like communication, managing people and personal effectiveness? Over the years, as a society, we've become more choice driven. Overall this is a great thing. We are all adults and most of us are capable of making good choices for ourselves. Sometimes we don't. Maybe this is because we don't like some of the options, we don't see the value or it's simply not a priority. How many times have we seen the senior manager opt of out performance management training because they 'know how to do it'? But they don't know how to do it well, and this has ramifications across the organisation. Maybe it's just because we are comfortable where we are. It's nice in our comfort zone isn't it? Over the school holidays my kids were more than happy to stay at home all day playing Minecraft, watching Horrible Histories and jumping on the trampoline. It was nice and comfortable for them. Familiar. It took no effort. When I suggested doing something different they were often reluctant (unless it was expensive and involved the chance of ice-cream of course!). Increasingly bored and frustrated, I took a more assertive approach. I took away their choice. "This afternoon we're going orienteering" I declared one day last week. "I don't want to go orienteering"
"Why can't we just stay here?" But go we did, and by the time we were hunting for our third marker, Minecraft, TV and boredom were forgotten. They were racing around, smiling and laughing, fighting over who got to read the map to find the next marker, and when we had finished they were surprised that it was over so quickly. They didn't want to go home, so we extended the visit to include half an hour on the playground (also deemed 'boring' eariler in the day). As with many things, it was the getting started that was hard. Once they HAD started, they created their own momentum. Isn't that often the way with training too? People find any and every excuse not to go unless their job literally depends on it. But when they do (reluctantly) attend, the vast majority of people find it useful and enjoyable. So whilst the adult in me says that people should be free to choose whether to attend training and which training they want, another part of me knows that often people don't know what's good for them until they have the benefit of hindsight. So how do we get the balance right? Answers on a postcard (or orienteering post) please! I've just returned from a PGL holiday. For those unfamiliar with PGL the basic idea is that it's an outdoor activity camp for kids: Abseiling, Kayaking, Climbing etc. Most of their 'business' is school groups throughout term time, but in the summer they open the centres up to families...who get exactly the same programme delivered in exactly the same way! There were about 120 people in the 'families' group, and we were split into groups of 12. We were so lucky to have 6 adults and 6 kids in our group and we all got on (always a bonus!). We did all our activities together. As the week went on, our knowledge of each other, friendship and trust grew. We manhadled each other over obstacles, gave each other tips and advice, cheered when people succeeded, 'pushed' each other when we felt hesitant and commiserated when we failed. As a result, we got tiny people to the top of 'Jacobs Ladder', got people scared of heights abseiling, and even the more reticent actively involved in every activity in some way or another. That's what doing things together, with support, challenge, peer pressure and encouragement does for you. I would have happily passed up the opportunity to do the 'Trapese' if it had been offered as an individual activity. Another lady would not have abseiled if she hadn't learned to trust us, and feel happy that we wouldn't judge her if she changed her mind. Another only went on the 'giant swing' so she didn't let her daughter down. That's also why, in this wonderous technological age when so much learning can accessed anytime anywhere, I still believe in getting people together in a group for training. When we learn together we share ideas, we build friendships and support networks, we encourage each other, we feel the 'peer pressure' and so have a go at things that we might not if we were alone as we don't want to let the group down. We push ourselves and IF we fail, we are commiserated with, and when we succeed we celebrate success together. Of course, learning together is also more FUN and ultimately more memorable because we remember the 'non-learning' stuff too, and this creates more pathways in our brains to retain and retrieve what we HAVE we learned. 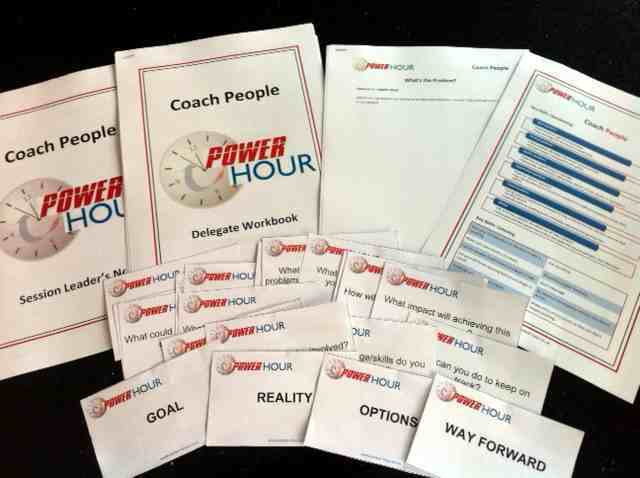 Time and organisation is always a factor with group training, but you don't need to go on a 5-day residential. You don't even need a full day. Getting people together for a short 1-2 hour session that is interactive, challenging and practical will almost always leave more of an impression that 2 hours of solo learning. Also, people are far more likely to have 'had a go'. This means the learning is more likely to retained, and therefore more likely to be applied. Isn't that what training is all about? This week, I've been to the Neurobusiness conference in Manchester, and it has given me lots of food for thought. Some things I need to reflect on and check out, whilst others are like finding a missing piece! One such session was about designing and implementing change, but change is what training is about so although the speaker (Gary Luffman) may have had large scale change in the forefront of his mind, I was focussing more on the small scale changes we try to bring about through training. Allowing people to identify their own training needs/objectives and define their own action plans means they are more likely to make a change. I was not aware that the brain is more active when we are standing up than sitting down...and I was pleased to finally have some justification for all the post-it note and flip chart exercises I write into courses. Neither did I know that properly thinking things through (in detail and step by step) is almost as useful as physical practice. Great news for those who hate role playing! Talking me through step by step what you would say and do in a particular situation is almost as good for your learning as showing me....It's all about creating patterns in the mind. I've said before that I'm a pragmatist. I don't care much for theories...I care for what works. That said, it was nice to understand a little more about WHY some of the things that work DO work. I realise that I'm cherry picking... I'm learning bit by bit, and as the old analogy states, the only way to eat and elephant is in small pieces... though why anyone would want to eat an elephant is beyond me! Being a new manager is scary. No two ways about it. Especialy if you have found yourself in a management position almost by accident. Even if it's something you've actively worked towards, actually being responsible for people, budgets and resources is scary. We can all comment, criticise and advise when we have no direct responsibility but when it's time to 'put our money where our mouth is' - it's quite different. I've been a manager twice in my career, and as my business grows, I find myself increasingly in a 'management' role. In all honesty, it's not something that comes easily to me. I'm not naturally good at it, but I like to think I'm competent. And that's because I apply the training I deliver. Got a difficult decision to make? - Use the decision-making tools I tell others to use. Struggling to get everything done? - Eisenhower my to-do list and find people who can help me out. Managing a team? - Remember all the things I teach about the importance of regular communication (even though I worry about it being 'overkill' and taking up too much of everyone's time - including my own). Got too much work? - Say no, politely but assertively. Identify a problem? - Identify possible solutions and then take it to the stakeholders if it's their decision to make rather than mine. And of course, the 'golden rule' - Do as you would be done by! Just because these things don't always come naturally to me, they sometimes feel awkward and forced. But that's the thing.... they FEEL awkward and forced to me. The people I'm working with or managing don't know how I feel. They only hear what I say and see what I do... and it isn't as bad as it feels. We all have to start somewhere, and we only get good at something by practising. At some point, there has to be a 'first time', and that's why I say to new managers go back to your training (and if you haven't had any) get some advice, take a moment to think about what you will do, then do it. It almost ceratinly won't be as bad as you expect, and you will probably do more good by being brave and dealing with the situation than if you just bury your head and wait for things to get sorted. As Yoda said "Do or Do Not - there is no Try".